To Cite: Nourmohammadi A, Doaee M, Mazloum Fazel A, Mousavi S A. Hyperbaric Oxygen Therapy and Quality of Life: A Systematic Review, Ann Mil Health Sci Res. 2017 ; 15(1):e59684. doi: 10.5812/amh.59684. Objective: Hyperbaric oxygen therapy (HBOT) involves breathing pure oxygen in a high-pressure chamber. HBOT is a well-established treatment for several diseases, such as serious infections, chronic diabetic foot ulcer, radiation injury, and hidradenitis suppurativa. There are various troublesome diseases that decrease pleasure in life in patients. HBOT has excellent effects in improving QOL in patients with acute and chronic diseases. The present study aimed at assessing the researches that focus on improving the QOL after HBO treatments. Methods: A systematic quest was conducted to evaluate English papers (clinical trials) that were published before April 2017. We searched PubMed, institute of scientific information (ISI), SCOPUS, Web of Science, Ovid, Science direct, ProQuest, Wiley, Cochran, Ebsco host, and Google Scholar. The reference lists of all the articles and electronic journals were searched for further studies. The JAMA users guide evaluation scales for RCTs was used to assess quality of the researched articles. Inclusion and exclusion criteria were extracted according to the scientific criteria. Sample size was 806 patients. Results: Finally, 15 published articles were extracted. Most researches were done in UK (26.7%), Israel (20%), and Sweden (20%). The mean age in HBOT group was 41.88, with a male to female ratio of 1.52. The mean age in the control group was 38.29, with a male to female ratio of 2.14. The most frequent clinical trials were those on the treatment of diabetic foot ulcer (20%), post-concussion syndrome (13.3%), pelvic radiotherapy (13.3%), and chronic arm lymphedema after radiotherapy (13.3%). The most QOL questionnaires used were SF-36 (21.4%), EORTC (European organization for research and treatment of cancer) QLQ-C30, head and neck cancer module (H&N35), and performance status scale (PSS). Conclusions: A significant effect of HBOT on improving QOL in patients’ outcomes and symptoms was found compared with the control group. We found improved QOL in patients with diabetic foot ulcer, post-concussion syndrome, pelvic radiotherapy, post stroke, hidradenitis suppurativa, tonsillar fossa tumor radiotherapy, jaw osteonecrosis, and fibromyalgia syndrome. We suggest that HBOT be added to conventional treatment of these patients as an adjuvant. Hyperbaric oxygen therapy (HBOT) means breathing 100% oxygen in a pressure more than environment in a chamber or tube. HBOT is an excellent treatment for decompression injury, which is a risk of scuba immersion (1). Other abnormalities treated with HBOT include serious infections, air bubbles in blood vessels, chronic diabetic foot ulcers, and radiation injury (2). Some clinical trials proved that HBOT are useful in the treatment of severe common ischemic diabetic foot ulcer (3). It increases long-term health related pleasure of life (QOL) in these patients, which is possibly attributable to better ulcer healing (3). HBOT has an effective impact on post-concussion syndrome (PCS) even years after mild traumatic brain injury (4). Different studies defined that HBO significantly improves hidradenitis suppurativa (HS) (2). QOL is an important health outcome, and it represents the final goal of all health interventions. QOL is measured as physical, mental, social functioning, and perceived physical and mental well-being (5). A large number of articles have shown the relevance of assessment of health-related quality of life (HR-QOL) and functional position as important findings in standard clinical outcomes (6). Radiotherapy is used in the setting of beneficial treatment for head and neck malignancies. Xerostomia and its related problems manifest when major salivary glands are included in the irradiation zone. This complication decreases QOL in patients. HBO is a unique therapy and a prevention choice for radio necrosis of the jaw bones and soft tissue. We do not know to what extent HBOT improves xerostomia and xerostomia-related health (7). HBO therapy leads to significant neurological improvement in post stroke patients in acute and late phases (8, 9). Hyperbaric oxygen therapy is safe for kids with radiation-induced bone and soft tissue necrosis; it does not cause any complication in them. HBOT is a potential option for prevention and treatment of radiation-related adverse events (10). HBOT is a healthy treatment modality suggesting rapid cure in the healing radiation-induced osteoradionecrosis either alone or as a combination therapy. Hyperbaric oxygen therapy cures radiation soft tissue necrosis, cystitis, and proctitis (11). There are various troublesome diseases that affect QOL in patients. Traditional and convenient medical treatments cannot change QOL in these patients. HBO significantly improves QOL in patients. A systematic review cumulates robust evidence to prove the clinical effect of a treatment. This systematic review aimed at assessing the researches that focused on change in quality of life of patients with different diseases after HBO treatments. We conducted a systematic search to find English articles (RCTs) that were published before April 2017. We searched PubMed, institute of scientific information (ISI), SCOPUS, Web of science, Ovid, Science direct, ProQuest, Wiley, Cochrane, Ebsco host, and Google Scholar as the main international electronic data sources. The reference lists of all the papers and electronic journals were searched for further researches. The medical subject headings (MESH), entry terms of PubMed, and entree of Scopus were used for most comprehensive and efficient searches. We used MESH keywords to search PICO Abbreviations, which were as follow: P: “Patients” [Mesh]; I: “Hyperbaric Oxygenation” [Mesh]; C: comparison group treated with no drug or routine treatment; and O: “Quality of Life” [Mesh]. Two independent authors (A.N and M.D) conducted data extraction using inclusion and exclusion criteria and excluded studies that did not use HBOT in a clinical trial (with follow-up). Quality assessment of clinical trial studies were performed by other authors (A.M & S.A.M) based on the consolidated standards of reporting trials (CONSORT) checklists. The item got a score of 1 if the answer to the item was “yes”. Then, we collected the score of all 6 items. We considered a study eligible in this systematic review, if it gained 3 of all 6 scores. Discrepancies were resolved through discussions between reviewers and reaching consensus. Quality assessment based on JAMA user guide was conducted on all 15 RCTs included in this research (Figure 1). Disease name, first author, country name, years of publication, sample size in intervention and control groups (male/female ratio in each group), QOL questionnaire name, complications, inclusion and exclusion criteria of each study, the mean age of patients in each intervention, control, follow-up time, type of convention treatment, and HBOT schedule in each disease. We resolved discrepancies through discussion among 3 reviewers and reaching a consensus. Inclusion criteria were as follow: HBO therapy, physical and mental health for HBOT, patients access to follow- up, and informed consent, age 18 years or older. Exclusion criteria were as follow: Having chest disease or abnormality, inner ear abnormality or disease, claustrophobia, no informed consent, pregnancy, pneumothorax, severe chronic obstructive pulmonary disease, recent chest surgery, upper or lower airway infection, mental problems (especially claustrophobia), head trauma, seizure, epilepsy, and heart failure (ejection fraction < 35%). Smoking was not allowed during the research. The initial search included 117 citations, of them 68 were duplicates, and 49 were examined in more details, 2 of which were excluded after reading the title and abstract. Then, 47 full texts were assessed by user guides, of them 16 studies were excluded because they lacked the required data, 10 studies failed in critical evaluation, and 6 did not have English full texts. Finally, 15 articles related to the study domain were found (Figure 1 and Table 1). Final studies included 14 prospective randomized and 1 non-randomized clinical trials. Abbreviations: ADL, activities of daily living; DLQI, dermatology life quality index, EQ-5D and EQ-VAS, quality of life questionnaire; HADS, hospital anxiety and depression scale; HSSI; hidradenitis suppurativa severity index; IBDQ, inflammatory bowel disease questionnaire; NIHSS, national institutes of health stroke scale; PRQ, post-concussion symptoms questionnaire; SS, modified Sartorius score; VAS, visual analog scale. aEuropean organization for research and treatment of cancer [EORTC] QLQ-C30, EORTC QLQ head and neck cancer module, (H&N35), performance status scale (PSS). The EQ-5D descriptive system and the EQ visual analogue scale (EQ-VAS). EQ-5D essentially consists of 2 pages: the EQ-5D descriptive system and the EQ visual analogue scale (EQ-VAS). Duke health profile, a 17-question generic self-reporting instrument with 6 health domains (physical, mental, social, general, perceived health, and self-esteem) and 4 dysfunction measurements (anxiety, depression, pain, and disability) (22). The countries for HBO therapy in these RCTs were UK (26.7%), Israel (20%), Sweden (20%), Indonesia (6.66%), Colombia (6.66%), USA (6.66%), Netherland (6.66%), and Turkey (6.66%). We had 415 patients in the intervention group (HBOT), with a mean age of 41.88 years and a male to female ratio of 164/108 (1.52). Also, the sample size in the control group was 391 patients (routine care), with a mean age of 38.29 years and a male to female ratio of 178/83 (2.14). The most frequent clinical trials that evaluated HBO therapy was in the treatment of diabetic foot ulcer (20%), post-concussion syndrome (13.3%), pelvic radiotherapy (13.3%), chronic arm lymphedema after radiotherapy (13.3%), ulcerative colitis (6.67%), stroke (6.67%), hidradenitis suppurativa (6.67%), tonsillar fossa tumor radiotherapy (6.67%), jaw osteonecrosis (6.67%), and fibromyalgia syndrome (6.67%). The researchers evaluated health-related quality of life with different questionnaires related to patients’ disease. They assessed multidimensional concept of QOL that included domains related to physical, mental, emotional, and social aspects related to a disease or its specific therapeutic approaches (Table 1). The most frequent questionnaire was SF-36 (36-item short form survey (21.4%) (23), EORTC QLQ-C30 (European organization for research and treatment of cancer), and QLQ, a questionnaire developed to assess the quality of life in cancer patients (24), H&N35 (Head and Neck) (25), and cancer module performance status scale (PSS) (26). All HBO therapy interventions were performed at multi- place hyperbaric chambers, and ideally, for 5 days a week according to schedule (eg, 8 weeks, 40 treatment sessions) (15). HBOT schedules for treating troublesome diseases that improved QOL of patients are presented in Table 2; we have several protocols for HBOT in various diseases. Nearly 100% of eligible studies used HBOT at 2.5 - 3 ATA/ 90 minutes daily 5 days a week for 8 weeks, extending over 10 weeks, but the sessions should have not exceeded 40. We did not find any side effects (inner and middle air barotrauma, sinus barotrauma, oxygen toxicity, and confinement anxiety) relevant to HBOT in this systematic review. aHBO therapy is added to conventional therapy for each disease. Of the patients, 46.7% used conventional treatment for their disease in the control group, 33.3% used air as placebo, 6.7% received no treatment in the control group, and 6.7% of the studies had no control group. 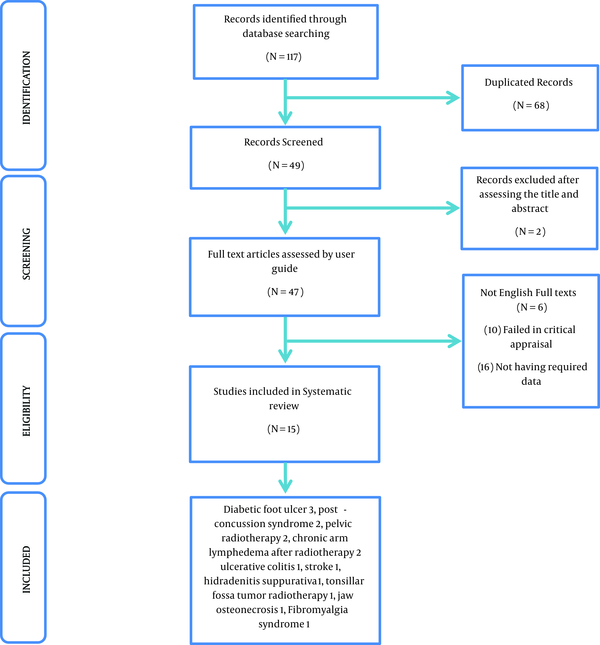 This systematic review aimed at evaluating data from clinical trials with follow-up to find success, failures, and complications of HBOT in improving QOL in patients. The results confirmed that HBOT is safe to be used in the treatment of patients with disabling and troublesome diseases and improves QOL. The number of clinical trials on HBO therapy is dramatically increasing because HBOT success is more than conventional therapy success in many diseases. HBOT is mostly performed in developed countries, such as USA and UK. According to SF-36 instrument, HBOT improves vitality, physical function, body pain, total health perceptions, mental health and physical, emotional, and social role functioning in patients with troublesome diseases (15, 17, 19, 21, 27). The main worldwide diseases for HBO therapy were chronic diabetic foot ulcers, post-concussion syndrome after brain injury, and chronic arm lymphedema after radiotherapy, or pelvic radiotherapy. The least clinical trials were on HBO therapy in acute attack of ulcerative colitis, stroke, hidradenitis suppurativa, tonsillar fossa tumor radiotherapy, jaw osteonecrosis, and fibromyalgia syndrome. The results presented here confirmed that HBOT caused no serious complications in patients. Moreover, the relative risks of death and morbidity (incidence of disease) and complication (hospital readmission, seizures, infection, and limb amputation) were not significantly improved in patients who received hyperbaric oxygen therapy compared with the control group. However, we could not use meta-analysis because of using different QOL questionnaires in different studies and because of the low number of some clinical trials. An excellent improvement was observed in QOL of patients who had received HBOT combined convention therapy compared with controls. Thus, future RCTs with more sample size would be required to incorporate more robust outcome measures. This review article was based on a comprehensive search strategy. We found an excellent effect of HBOT on promoting QOL of diabetic patients by healing their foot ulcers. AJ Bishop et al. conducted a literature review and concluded that HBOT reduces amputation rates and improves healing wounds in diabetic patients (28). Kessler L et al. indicated that HBOT accelerates the cure rate of no ischemic chronic diabetic foot ulcers (29). Kalani M et al. found that adjunctive HBOT is excellent for healing specific patients with diabetic foot ulcers. It accelerates the rate of cure, decreases the need for foot amputation, and increases the pleasure in life in long-term follow-ups (30). Adjunctive HBOT is the best choice for improving mental, physical, and social aspects of QOL in these patients. HBOT is a non-invasive and no-drug way to repair damaged tissue; its positive effect is the result of 2 oxygen-dependent processes. Researchers ascertained a large and multicenter cohort for evaluating HBOT in chronic traumatic brain injury and post-concussion syndrome. They found that multiple doses of hyperbaric therapy are effective in the treatment of PCS, while others are not (31). Paul G. Harch et al. mentioned that the biological effects from 1 minute exposure to 1.09 ATA or 3 minutes at 1.04 ATA promote the symptomatic improvements in central nervous system (32). HBOT is the best choice for these patients to improve their health state, usual activities, anxiety, and depression (4). Radiation therapy is used successfully to cure pelvic malignancies, but morbidity from hemorrhagic cystitis is a major long-term complication in 1% to 2% of patients. Obliterative endarteritis secondary to ionizing radiation leads to cells hypoxia and poor tissue improvement (33). HBOT can improve healing these lesions. Ranjiv Mathews et al. concluded that HBOT improved angiogenesis and increased cure in radiation injured tissue, such as bladder (34). Romana Mayer et al. demonstrated that HBOT was an effective treatment to heal patients with late gastrointestinal and genitourinary morbidity, when conventional drug was not effective. HBOT should be prescribed as soon as possible in patients with radiation cystitis (33). In this review, we found that HBOT improves patients’ functional impairment and subjective well-being by tonsillar fossa tumor radiotherapy (13) and pelvic radiotherapy (18) by oxygenation and lesion repair. Lymphedema due to radiation is a common and major side effect of breast cancer curative therapy in early stages. HBOT improves cure in bone ischemic due to radiotherapy and improves soft tissue injuries too, but it is untested in arm lymphedema (20). In this review, we did not find QOL improvements in these patients. Perhaps, the type of questionnaires (EORTC QLQ-C30) was inappropriate or sample size was small, according to authors’ description (20). Lone Gothard in 2010 did not find good evidence for HBOT in the treatment of arm lymphedema following breast cancer surgery and its adjuvant radiotherapy in early stages (19). HBOT cannot improve QOL in these patients. Stroke recovery correlates with non-active brain lesions, which may persist for a long time. We found significant improvements in patients with stroke following HBOT, and it can lead to neurological improvements even at late chronic stages (11). Gennady G. Rogatsky et al. demonstrated the efficacy of HBOT in neurologic status of acute ischemic stroke (35). HBOT improves consciousness level, sensory and motor function, and daily living activity in patients after acute or chronic stroke (16). Hidradenitis suppurativa (HS) is a chronic suppurativa and scarring inflammatory disease with predilection in the apocrine gland-bearing fields (36). We found that adjunctive HBOT is effective in improving antibiotic treatment of HS. HBOT has good tolerance, with no unexpected complications. Ozdemir et al. found that HBOT is an effective therapy in problem wounds and can be used in managing HS lesions (37). HBOT decreases skin problem (painful lesions, daily living activity, social activities, and relationships) and has a positive effect on patients’ life (2). Radiotherapy of this area causes severe pain in swallowing, sticky saliva, xerostomia, and pain in mouth. Teguh et al. found that Patients, who receive HBOT after tumor radiotherapy in mouth and fossa, have better QOL scores (13). CHU H et al. concluded that HBOT is a good adjuvant in radiotherapy for advanced oropharyngeal cancer (38). These results are relevant to our systematic review. HBOT can decrease pain in mouth and jaw, soreness in mouth, painful throat, and dry mouth (13). Bisphosphonates prevent bone turnover by suppressing osteoclast signal transduction, maturation, and longevity. In these patients, suppressed turnover can impair oral wound healing, leading to a painful mouth, and osteoporosis-like jaw necrosis called bisphosphonate-related osteonecrosis of the jaws. Freiberger et al. found that hyperbaric oxygen therapy has the potential effect to improve bone turnover by signaling the impact on osteoclasts (39). Marx et al. indicated that HBOT can prevent osteoradionecrosis (40). Their results are similar to our findings. HBOT improves sleeping, nervousness, feeling, and social activities in patients (22). Fibromyalgia is a chronic pain in multiple areas of the body (41). Chronic pain is one of the most clinical problems, which is difficult to treat. HBOT treatment has been done for patients with chronic pain syndromes with excellent effectiveness (42). Sutherland et al. indicated that HBOT is useful in modulating animal and human pain (43). In our systematic review, the efficacy of HBOT in healing and improving general health, daily activity, emotional problems, and body pain in patients was confirmed (15). HBOT has a very good effect on colonic damaged tissues (44). Buchman AL et al. found that HBOT is the first successful treatment in ulcerative colitis, refractory to conventional therapies (45). Gulec et al. concluded that HBOT has beneficial effects on the course of distal colitis and that antioxidant systems may be involved in its mode of action (46). In our study, we did not find detectable differences in QOL of patients. According to authors’ comments, perhaps the reason for lack of evidence on HBOT as a treatment option in a severe attack of UC was the small number of patients (17). HBOT is a safe procedure for disease treatment and improves different aspects of QOL in patients with diabetic foot ulcer, post-concussion syndrome, pelvic radiotherapy, stroke, hidradenitis suppurativa, tonsillar fossa tumor radiotherapy, jaw osteonecrosis, and fibromyalgia syndrome. HBOT is not done in Iran as well as other countries. Policymakers should support hyperbaric medical doctors (M.D.) to establish HBOT chambers for more research and treatment and increase QOL in patients all over the world, especially in Iran. We suggest that HBOT be added to conventional treatment of these patients as an adjuvant. The main limitation of our systematic review was the lack of numerous RCTs for treatment of different types of diseases. Most articles were prospective studies without clinical trials. The best suggestion is designing appropriate RCTs with large sample size to gain robust evidence about HBOT benefits, failures, and complications in treatment of different types of diseases in the world. The authors would like to thank all patients under HBOT for their kind collaboration to develop science.